Sacrifice Feast Day in Turkey also called Eid al-Adha is a four day religious festival and is a time of thanks and helping the poor. 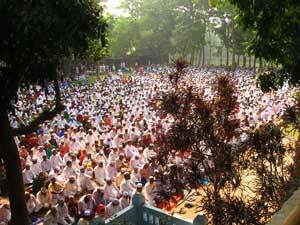 The festival begins on the 10th day of Dhu al-Hijjah according to the Islamic calendar. This day commemorates the story about Ibrahim who agreed to sacrifice his son at God's request and later that request was changed by God sending him a Ram to sacrifice. Traditionally men will go to a morning prayer session at a mosque and later the sacrifice ritual will take place. Prior to slaughtering the animal the butcher will read a prayer first. Two-thirds of the animal meat is shared between family and friends with the other one-third calendar to the poor. Others on this day will give money or other things to help out the poor. The Sacrifice Feast takes place roughly 70 days after the Ramadan Feast. The exact date is the four days following the 10th day of the Islamic month of Dhu al-Hijja and relate to the sighting of the new moon to determine each new month.